Oct - 12 | By: NW Film Center | no comments. October 20, 2018. 10AM to 4PM. Northwest Film Center. $45. 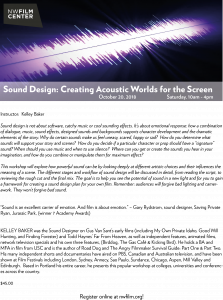 Visit https://nwfilm.org/classes/sound-design-creating-acoustic-worlds-for-the-screen/ for more information and to register. Sound design is not about software, catchy music or cool sounding effects. It’s about emotional response: how a combination of dialogue, music, sound effects, designed sounds and backgrounds supports character development and the dramatic elements of the story. This workshop will explore how powerful sound can be by looking deeply at different artistic choices and their influences the meaning of a scene. The different stages and workflow of sound design will be discussed in detail, from reading the script, to reviewing the rough cut and the final mix. The goal is to help you see the potential of sound in a new light and for you to gain a framework for creating a sound design plan for your own film. Remember: audiences will forgive bad lighting and camerawork. They won’t forgive bad sound. Instructor KELLEY BAKER was the Sound Designer on Gus Van Sant’s early films (including My Own Private Idaho, Good Will Hunting, and Finding Forester) and Todd Haynes’ Far From Heaven, as well as independent features, animated films, network television specials and his own three features, (Birddog, The Gas Café & Kicking Bird). He holds a BA and MFA in film from USC and is the author of Road Dog and The Angry Filmmaker Survival Guide: Part One & Part Two. His many independent shorts and documentaries have aired on PBS, Canadian and Australian television, and have been shown at Film Festivals including London, Sydney, Annecy, Sao Paulo, Sundance, Chicago, Aspen, Mill Valley and Edinburgh. Based in Portland his entire career, he presents this popular workshop at colleges, universities and conferences across the country.